An enormous geological map of the former Soviet Union that was internationally renowned when it was first issued. Geological Map of the U.S.S.R. / ГЕОЛОГИЧЕСКАЯ КАРТА CCCP. This is a 1968 Dimitri Vasilievich Nalivkin geological map of the Union of Soviet Socialist Republics (U.S.S.R). The map depicts the region from Poland to the Pacific Ocean and from the Arctic Ocean to Iran, China, and Japan. Strikingly beautiful and meticulously detailed, this enormous map garnered international attention when the first edition was issued in 1957, due to the fact that information of this nature regarding the Soviet Union was not readily available. 117 different geologic formations are indicated, with each formation illustrated by a different color. Fourteen different color families are utilized to differentiate between different types of formations, while shades within each color family are employed to illustrate related, but not identical, formations. Each different color region is labeled with the corresponding symbol, which matches the symbols in the key situated along the bottom border. Major cities and towns are identified and labeled throughout the Soviet Union, including Moscow, Prague, and Minsk. Roads are illustrated and labeled, along with rivers, lakes, and mountain ranges. The Black, Caspian, and Aral Seas are all illustrated, with different shades of blue indicating water depth, a system that is also used in the oceans. This map was created by Dimitri Vasilievich Nalivkin and printed by the Ministry of Geology in 1968. This map is held in several institutional collections, but is exceedingly rare on the market. Dimitri Vasilievich Nalivkin (Дми́трий Васи́льевич Нали́вкин August 13 (25), 1889 - March 3, 1982) was a Russian Soviet geologist and paleontologist. Born in St. Petersburg, Nalivkin graduated from the Tenishev School in 1907. After graduation he began working as a collector for the Geological Committee, the first major state geological institution in the Russian Empire. Nalivkin was considered an expert in central Asian geology by 1915, the year he graduated from the Petrograd Mining Institute, and was asked by the Russian Geographical Society to lead an expedition to study glaciers in the Pamir. In 1917, after being demobilized from military service in World War I, he was elected to the Geological Commission of Russia, and was associated with the organization for more than sixty years. He completed his doctorate in 1924at the Saint Petersburg (Petrograd) Mining University, where he eventually became the head of the department of historical geology. During World War II, Nalivkin used his research to search for bauxite, a key metal in aircraft construction, to help with the war effort. His most significant achievement, however, was the creation of an index geological map of the USSR, which attracted significant international attention. 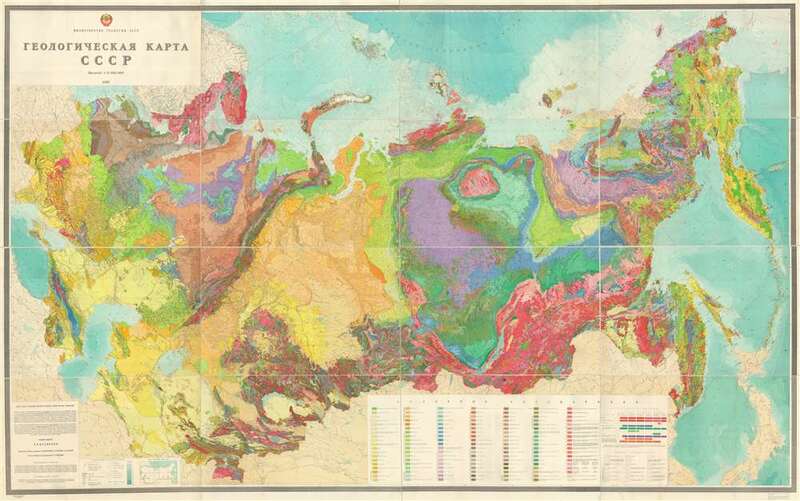 He was awarded the Lenin Prize in 1957 after completing this monumental Geological Map of the USSR. Very good. Mounted on linen. Blank on verso.